Hamburg’s vast green spaces, predominantly flat terrain, and well-developed cycling infrastructure makes it a perfect city to explore by bike. Join a guided bicycle tour or, better yet, rent a bicycle and discover the city by yourself. For example, pick up a red StadtRAD city bike from one of the over 200 stations across the city, the first half an hour is free. One of the easiest and most beautiful cycling routes lies in the very heart of the city. The bicycle paths along Lake Alster are perfect for a leisurely cruise from City Hall, around the large lake and back, and will take less than an hour. Enjoy the waterside green areas, views of the sailing boats on the lake and the lavish mansions on its shore. Make a stop on the Krugkoppelbrücke and the Feenteichbrücke to make splendid photos or have a coffee in one of the picturesque lakeside cafes. Instead of cycling around the lake, you can turn left once you have crossed the aforementioned Krugkoppelbrücke and head north. Keep the Alster to your left and enjoy the peaceful streets of the city’s affluent and green residential neighbourhoods of Winterhude and Alsterdorf. The Alster will lead you to Friedhof Ohlsdorf, the largest park cemetery in the world. The cemetery’s pathways stretch over 17km (11 mi.) and welcome cyclists to revel in its tranquil scenery adorned by beautiful sculptures, trees, and waterways. Likely, there is no better way of capturing the essence of Hamburg than a round-trip to see the harbour—the true heart of the city—and the demonstration of the wealth that it brings. Start at Landungsbrücken and descend into the Old Elbe Tunnel to cross to the other side of the river. 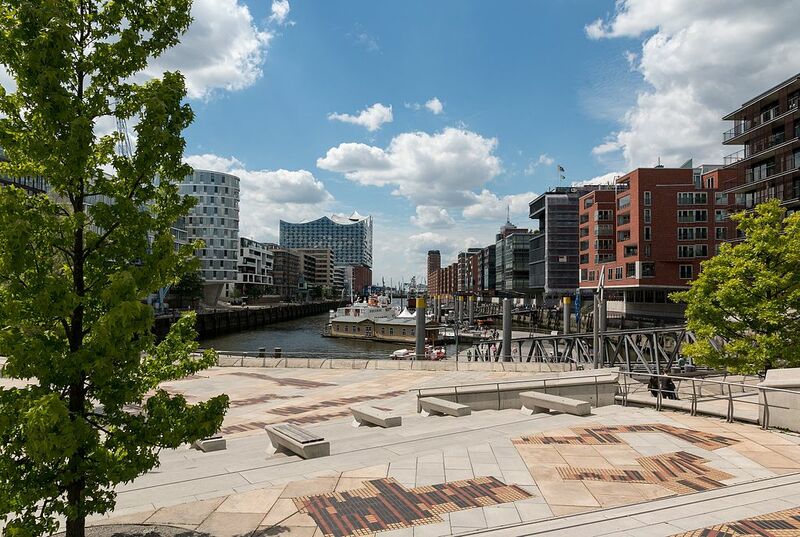 Enjoy the gorgeous views across the water from the viewing point, then follow the Reiherdamm and Veddeler Damm until you circle back north into the HafenCity. Admire the best that modern architecture has to offer alongside the historic Speicherstadt district, Hamburg’s UNESCO heritage site. Also the shore of the River Elbe is ideal for cycling and the length of the trip is easily adaptable. Again, start from the harbour at Landungsbrücken and head towards the famous Fischmarkt, then continue cycling alongside historic residential buildings and brand new office buildings, to the museum harbour at Övelgonne. Make a stop here to enjoy a coffee and an ice cream on the sandy Elbe beach. Then follow the riverside promenade that starts on the other side of the beach towards the charming Blankenese to see Hamburg’s ‘Mediterranean’ side. Take the metro to Veddel to explore Hamburg’s up-and-coming district of Wilhelmsburg. Once an industrial and relatively poor area, over the last decade it’s emerging as one of the city’s trendiest neighbourhoods. From the station simply follow the clearly marked LOOP—the city’s modern cycling path developed specially for the International Building Exhibition that was hosted here in 2013. Explore Hamburg’s urban side, check out the grounds of the hip Dockland festival and enjoy the extensive island park, a unique green oasis created for the International Garden Show. Hamburg is one of the greenest cities in Europe and its parks are ideal for a leisurely round-trip by bicycle. Start at the Altona metro station, head towards the Altonaer Rathaus and turn right into the Elbchaussee. From here on you’ll be surrounded by splendid city villas, views across the river beneath and numerous picturesque parks. Turn into the Jenischpark, one of Hamburg’s oldest and most beautiful parks, then continue to the Loki Schmidt Garden, the gorgeous and diverse new botanical garden, then hop back on the S-bahn to return to the city. There is no better escape of the bustling city than a bicycle tour of the Altes Land, Germany’s largest orchard in the floodplains of the River Elbe. Hop on the harbour ferry at Landungsbrücken and cross over to Finkenwerder. From here on you’ll be surrounded by fruit gardens, waterways and wind mills reminiscent of Holland, beautiful old farmhouses and idyllic small towns. Cycle along the dykes to Jork, the heart of the region, then continue along the water to Stade from where the metro will take you back to the city.